Chrystal Kornegay was appointed as a member of the MBTA’s Fiscal Management and Control Board in January 2019. She also serves on the Massachusetts Department of Transportation (MassDOT) Board of Directors. 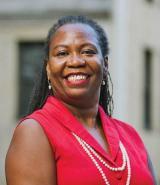 Kornegay, executive director of MassHousing since 2018, has held several senior management roles where she worked closely with members of the Massachusetts Legislature, designed and implemented strategic plans, collaborated with community groups on housing and community development issues and oversaw budgets in the millions of dollars. Before joining MassHousing, Kornegay served as undersecretary of Housing and Community Development for the Commonwealth of Massachusetts. Prior to that, she was the president and CEO of the community development corporation Urban Edge, and a project manager for The Community Builders. Kornegay is a graduate of the Executive Education Program at Harvard University’s Kennedy School of Government. She holds a master’s degree in urban planning from the Massachusetts Institute of Technology and a bachelor’s degree in urban planning from Hunter College.